Cave Tools BBQ Grill Gloves are a best-seller for both professional chefs or the home cook. Offering protection from high temperatures with a flexible and comfortable fit, these gloves will replace any other old or flimsy mitts. Cave Tools BBQ Grill Gloves are a best-seller for both professional chefs or the home cook. Offering protection from high temperatures with a flexible and comfortable fit, these gloves definitely should replace any other old or flimsy mitts lying around the kitchen. 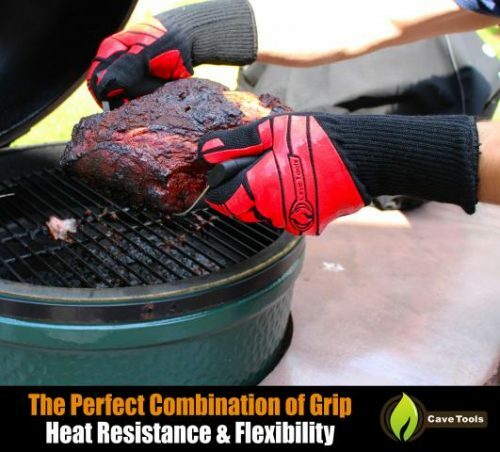 A perfect combination of grip, protection, and heat resistance, the Cave Tools BBQ Grill Gloves offer the best solution for all cooking and grilling needs. With each purchase several add-ons are included. 25 professional BBQ recipes for inspiration, step by step instructions and video tutorials, and a free app to download called the Meat Smoking Journal. The app has a cooking guide on how to properly cook all types of meat, plus 3 integrated timers to help with keeping track of smoking times, when to add sauce, and all the little details to successful smoke meat. Made from lightweight flame retardant material with a cotton lining, the gloves are able to resist heat up to 662 degrees Fahrenheit. Cave Tools BBQ Glove Mitts have extra-long cuffs which protects further down the arm so that reaching into the back of an oven is not a problem anymore. Simple and easy to clean, gloves can be washed by hand or put into the washing machine. Other glove mitts don’t offer the same heat protection and are often very clumsy and hard to handle. Try the Cave Tools BBQ Glove Mitts and feel the difference. The gloves bend and grip easily to handle hot dishes or food. The best part is that every purchase has a lifetime satisfaction guarantee. If for any reason the purchaser is not happy with the Cave Tools BBQ Glove Mitts, they can be returned for a full refund. This shows just how much the Cave Tools company believes in their product. Why wait, try a pair today.